For the video game, see Gyruss. "Gyral" redirects here. For the album, see Gyral (album). 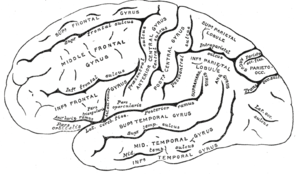 In neuroanatomy, a gyrus (pl. gyri) is a ridge on the cerebral cortex. It is generally surrounded by one or more sulci (depressions or furrows; sg. sulcus). 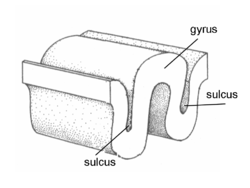 Gyri and sulci create the folded appearance of the brain in humans and other mammals. Gray's FIG. 726 – Lateral surface of left cerebral hemisphere, viewed from the side. Gray's Fig. 727 – Medial surface of left cerebral hemisphere. 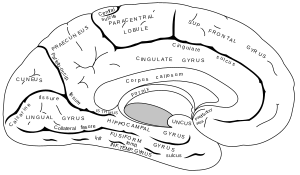 The gyri are part of a system of folds and ridges that create a larger surface area for the human brain and other mammalian brains. Because the brain is confined to the skull, brain size is limited. Ridges and depressions create folds allowing a larger cortical surface area, and greater cognitive function, to exist in the confines of a smaller cranium. The human brain undergoes gyrification during fetal and neonatal development. In embryonic development, all mammalian brains begin as smooth structures derived from the neural tube. A cerebral cortex without surface convolutions is lissencephalic, meaning 'smooth-brained'. As development continues, gyri and sulci begin to take shape on the fetal brain, with deepening indentations and ridges developing on the surface of the cortex. Changes in the structure of gyri in the cerebral cortex are associated with various diseases and disorders. Pachygyria, lissencephaly, and polymicrogyria are all the results of abnormal cell migration associated with a disorganized cellular architecture, failure to form six layers of cortical neurons (a four-layer cortex is common), and functional problems. The abnormal formation is commonly associated with epilepsy and mental dysfunctions. Pachygyria (meaning "thick" or "fat" gyri) is a congenital malformation of the cerebral hemisphere, resulting in unusually thick gyri in the cerebral cortex. Pachygyria is used to describe brain characteristics in association with several neuronal migration disorders; most commonly relating to lissencephaly. Lissencephaly (smooth brain) is a rare congenital brain malformation caused by defective neuronal migration during the 12th to 24th weeks of fetal gestation resulting in a lack of development of gyri and sulci. Polymicrogyria (meaning "many small gyri") is a developmental malformation of the human brain characterized by excessive folding of the gyri and a thickening of the cerebral cortex. It may be generalized, affecting the whole surface of the cerebral cortex or may be focal, affecting only parts of the surface. ^ Deng, Fan; Jiang, Xi; Zhu, Dajiang; Zhang, Tuo; Li, Kaiming; Guo, Lei; Liu, Tianming (2013). "A functional model of cortical gyri and sulci". Brain Structure and Function. 219 (4): 1473–1491. doi:10.1007/s00429-013-0581-z. ISSN 1863-2653. PMC 3909019. PMID 23689502. ^ Marieb, Elaine N.; Hoehn, Katja (2012). Human Anatomy & Physiology (9th ed.). Pearson. ISBN 978-0321852120. ^ Cusack, Rhodri (April 2005). "The Intraparietal Sulcus and Perceptual Organization". Journal of Cognitive Neuroscience. 17 (4): 641–651. CiteSeerX 10.1.1.452.462. doi:10.1162/0898929053467541. PMID 15829084. ^ Armstrong, E; Schleicher, A; Omran, H; Curtis, M; Zilles, K (1991). "The ontogeny of human gyrification". Cerebral Cortex. 5 (1): 56–63. doi:10.1093/cercor/5.1.56. PMID 7719130. ^ Barkovich, A. J.; Guerrini, R.; Kuzniecky, R. I.; Jackson, G. D.; Dobyns, W. B. (2012). "A developmental and genetic classification for malformations of cortical development: update 2012". Brain. 135 (5): 1348–1369. doi:10.1093/brain/aws019. ISSN 0006-8950. PMC 3338922. PMID 22427329. ^ Pang, Trudy; Atefy, Ramin; Sheen, Volney (2008). "Malformations of Cortical Development". The Neurologist. 14 (3): 181–191. doi:10.1097/NRL.0b013e31816606b9. ISSN 1074-7931. PMC 3547618. PMID 18469675. ^ Guerrini R (2005). "Genetic malformations of the cerebral cortex and epilepsy". Epilepsia. 46 Suppl 1: 32–37. doi:10.1111/j.0013-9580.2005.461010.x. PMID 15816977. ^ Dobyns WB (1987). "Developmental aspects of lissencephaly and the lissencephaly syndromes". Birth Defects Orig. Artic. Ser. 23 (1): 225–41. PMID 3472611. ^ Chang, B; Walsh, CA; Apse, K; Bodell, A; Pagon, RA; Adam, TD; Bird, CR; Dolan, K; Fong, MP; Stephens, K (1993). "Polymicrogyria Overview". GeneReviews. PMID 20301504.